INTRODUCTION: Since 2007, transoral incisionless fundoplication (TIF) has been employed for endoscopic treatment of gastroesophageal reflux disease (GERD). Full thickness polypropylene H-fasteners create a serosa to serosa gastroesophageal plication to create a mechanical barrier to reflux. Multiple cohort studies in the United States and Europe have examined the effect of TIF on subjective and objective measures of gastroesophageal reflux. The aim of this meta-analysis was to evaluate the worldwide experience with TIF to date and to assess the effect of this procedure on patient symptoms and esophageal acid exposure. 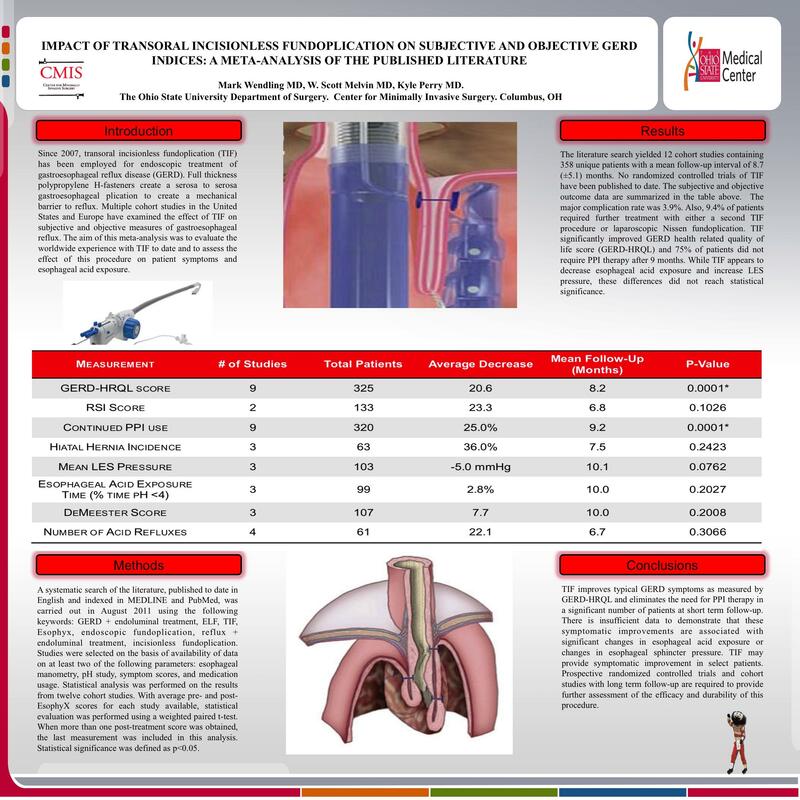 METHODS: A systematic search of the literature, published to date in English and indexed in MEDLINE and PubMed, was carried out in August 2011 using the following keywords: GERD + endoluminal treatment, ELF, TIF, Esophyx, endoscopic fundoplication, reflux + endoluminal treatment, incisionless fundoplication. Studies were selected on the basis of availability of data on at least two of the following parameters: esophageal manometry, pH study, symptom scores, and medication usage. Statistical analysis was performed on the results from twelve cohort studies. With average pre- and post-EsophyX scores for each study available, statistical evaluation was performed using a weighted paired t-test. When more than one post-treatment score was obtained, the last measurement was included in this analysis. Statistical significance was defined as p<0.05. RESULTS: The literature search yielded 12 cohort studies containing 358 unique patients with a mean follow-up interval of 8.7 (±5.1) months. No randomized controlled trials of TIF have been published to date. The subjective and objective outcome data are summarized in the table below. The major complication rate was 3.9%. Also, 9.4% of patients required further treatment with either a second TIF procedure or laparoscopic Nissen fundoplication. TIF significantly improved GERD health related quality of life score (GERD-HRQL) and 75% of patients did not require PPI therapy after 9 months. While TIF appears to decrease esophageal acid exposure and increase LES pressure, these differences did not reach statistical significance. CONCLUSIONS: TIF improves typical GERD symptoms as measured by GERD-HRQL and eliminates the need for PPI therapy in a significant number of patients at short term follow-up. There is insufficient data to demonstrate that these symptomatic improvements are associated with significant changes in esophageal acid exposure or changes in esophageal sphincter pressure. TIF may provide symptomatic improvement in select patients. Prospective randomized controlled trials and cohort studies with long term follow-up are required to provide further assessment of the efficacy and durability of this procedure.